Despite the term being in our popular lexicon for the better part of a century, but some people still shy away from calling themselves a feminist. The whys and wherefores might be different for each individual, but it's a term and a mindset that should be fully embraced, according to Jodi Marr and Hannah Dugas, and they hope to spark a discussion about just that beginning this Thursday, February 7, with the very first Feminist Book Club at the Aurora Public Library. This is the very idea that will be discussed with their first selection, the book “We Should All Be Feminists” by Chimamanda Ngozi Adichie, says Ms. Marr, APL's Manager of Customer Opportunity. While history has shown us that feminism comes in waves, the time is just right to bring a discussion group like this to APL, they say. Ms. Marr cites Women's Marches, which have become a bold, colourful movement over the last two years. Although she has not attended a Women's March herself, she has many friends and colleagues who have. She's conscious that not everyone can show their support for a moment in that way, or feel comfortable doing so, but this book club is a step in the right direction. These conversations have been going on for a long time, Ms. Marr notes, and people “sometimes forget there are still places in the world” where these conversations need to be had. The Feminist Book Club's inaugural meeting is this Thursday, February 7, from 7 – 8.30 p.m. at the Aurora Public Library. Registration is required, but admission is free. For more information, contact the Adult Information Desk at 905-727-9494x275. Additional dates include March 7 (Men Explain Things to Me by Rebecca Solnit), April 16 (Dietland by Sarai Walker), May 14 (Shrill by Lindy West) and June 19 (The Power by Naomi Alderman). Excerpt: Despite the term being in our popular lexicon for the better part of a century, but some people still shy away from calling themselves a feminist. 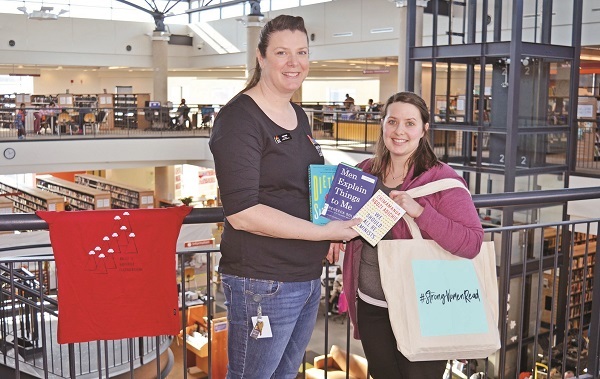 The whys and wherefores might be different for each individual, but it’s a term and a mindset that should be fully embraced, according to Jodi Marr and Hannah Dugas, and they hope to spark a discussion about just that beginning this Thursday, February 7, with the very first Feminist Book Club at the Aurora Public Library.